When one of Linda Miller’s first customers bought a condominium on Highway 30-A in Northwest Florida back in 1998 and called to say, “I’m back on the smile,” Miller wasn’t sure what she meant. But the explanation changed Miller’s outlook on both life and business when her customer explained, “When my car turns onto 30-A, I just start to smile.” Miller couldn’t stop thinking about that simple, happy notion, and she’s used it as a mantra over the years. 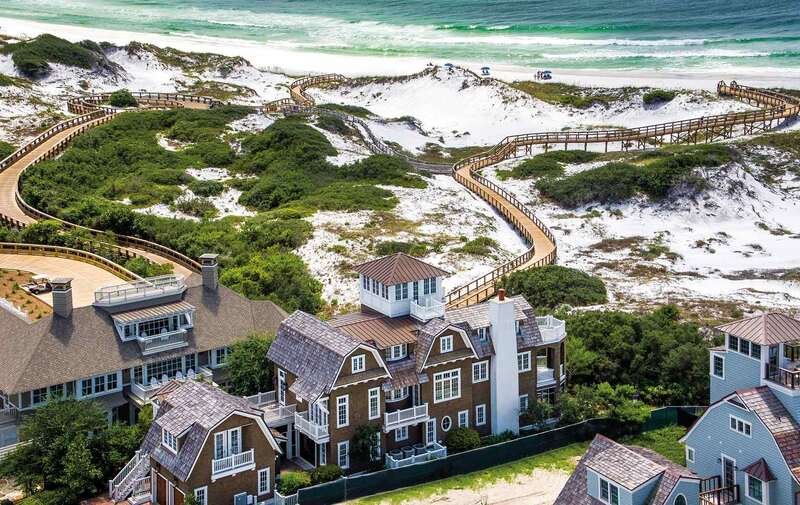 Now Miller is the vice president and broker at Rosemary Beach Realty and represents the Who’s Who in Luxury Real Estate Board of Regents in the area. 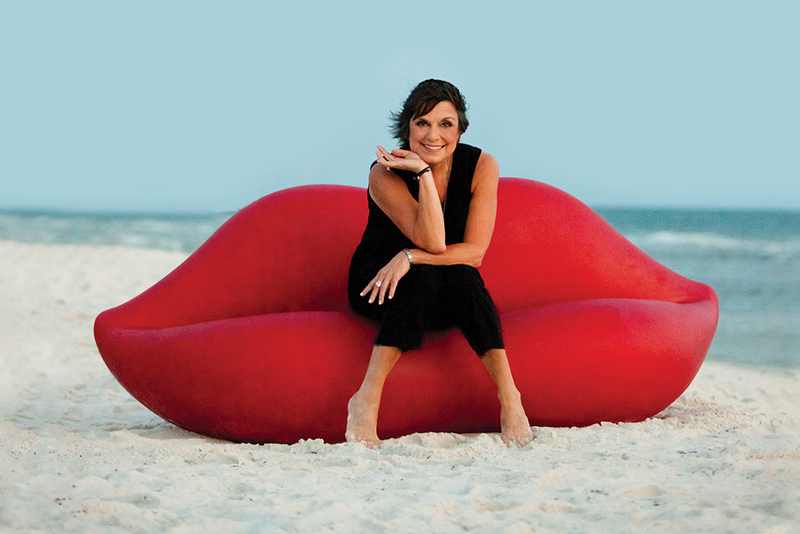 Her brand has grown to one of the most successful real estate brokerages on Scenic Highway 30-A as Miller represents buyers and sellers of many of the area’s top properties—and she does it all with a smile and a red sofa resembling a huge pair of lips. We caught up with Miller to discuss her philosophy, living and working on 30-A, and some of the most beautiful residences on the market. With 19 years of sales experience, Linda Miller has been the number one agent since 2015 with over $130 million in sales, and in 2017 has sold over $86 million YTD on 30-A. 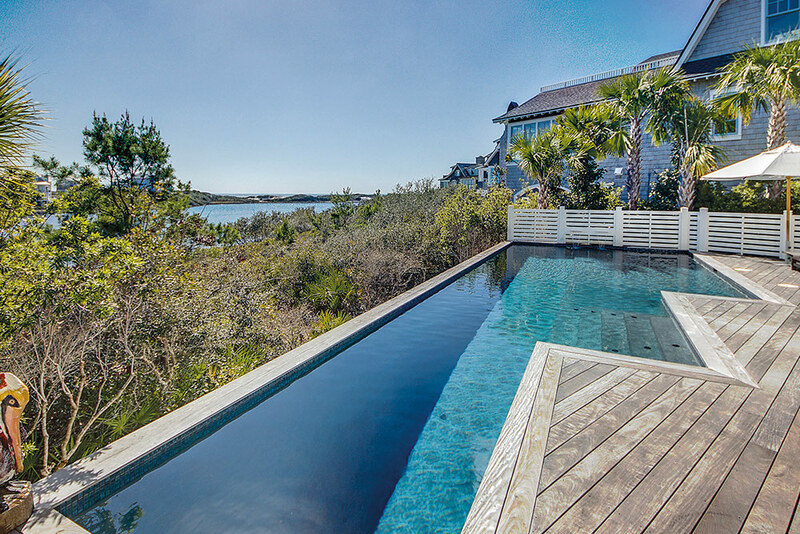 She brokered the largest sale ever on 30-A at 24 South Briland in Rosemary Beach for $12.5 million in 2016. VIE: Your nickname is the Smile of 30-A, and customers are intrigued by the smile sofa that often travels to events and open houses with you. Which came first, the nickname or the sofa? Linda Miller (LM): After I spoke to my customer who said “I’m back on the smile,” I called her back—we were talking on car phones the size of shoe boxes—and asked for permission to adopt her phrase, and I became the “Smile of 30-A.” My slogan is “When you own property on 30-A, you’ll be smiling, too.” Denise Creehan created my logo, and the smile was born. If you use your imagination, the Scenic Highway does resemble a smile as it veers off of Highway 98 at the west end and back onto 98 at the east end. Now, the smile sofa is another thing. 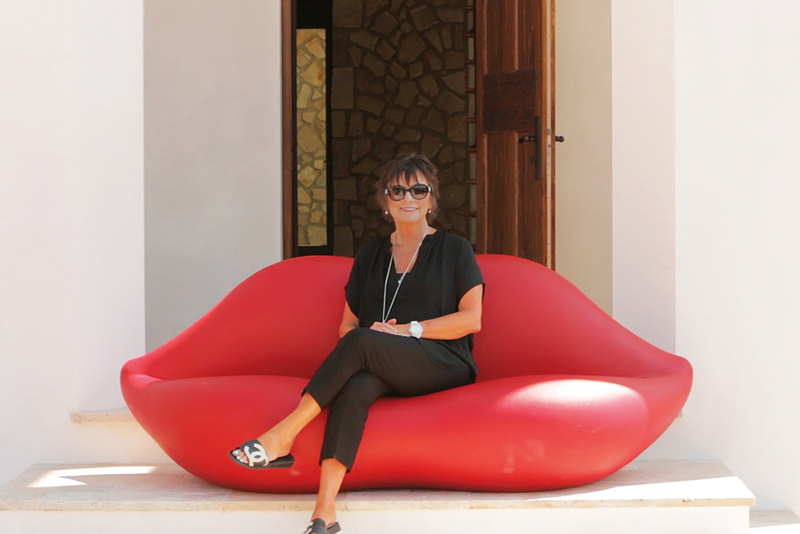 My dear friend and mentor, architect Darrell Russell, found the sofa online; it’s reminiscent of the Mae West Lips Sofa by Salvador Dalí. Darrell sent it to me with instructions to “Purchase this and get busy executing your logo more professionally with higher standards.” Now, that’s a real friend! Photographer Tommy Crow brought his magic touch to my branding images, and the smile reigns in its memorability to this day. Most men will refer to it as “the lips,” and I remind them that it’s an expression, not a body part! Smiling reduces stress, affects hormone levels, increases endorphins, and lowers blood pressure. Your smile is a curve that can get a lot of things straight. One of my favorite quotes is “Worry does not empty tomorrow of its sorrow. It empties today of its strength.” So you might as well smile! A smile is very powerful. It provides the same brain stimulation as two thousand chocolate bars and can feel as good as receiving $25,000 in cash. Smiling reduces stress, affects hormone levels, increases endorphins, and lowers blood pressure. Your smile is a curve that can get a lot of things straight. VIE: What is your favorite thing about living, working, and playing in the Northwest Florida area? LM: I love the pace of life here. Even in the busy tourist season, we still drive slowly on a two-lane scenic highway. I love seeing the eighteen-mile bike path full of families riding bikes, walking, and running, and most of them are—you guessed it—smiling! We have the beauty of a movie set to live and work in, among rare coastal dune lakes, sugar-white sand, state parks, and crystal clear water. I love the fact that we have all chosen to be here and there’s a camaraderie about that. There was this great guy from Grayton Beach named Tyrone who coined a phrase: “We are all here because we are all not there.” I think that about sums it up. There is also a nice diversity in the population here as more and more people work from home and can choose where they want to live. I’m very excited about the growth in the area. I realize some people want to keep it the way it is, but really, nothing stays the same. The only thing really certain in life is change. I’m looking forward to trying to make this the best scenic highway it can be. VIE: What is the “Linda Miller Phenomenon”? LM: I do my best not only to be the smile but to live it as well. A smile is priceless to the person who hasn’t had one all day, and yet it’s free to the giver. It only takes a moment to make someone’s day. I try never to be too busy to see a need in someone, to ask how their day has been, or to take a minute to look into a person’s eyes and listen to them. I strive to live my life based on four foundations that keep me grounded: faith, family, financial stability, and fun! I work very hard to be able to give back to my family and have financial rewards flow through me to those who need help. My daughter and son have honored me with six grandchildren, ranging from five to twenty-one years old, and I love the fact that my “grands” have grown up visiting their “Mimi” at the beach. They love this sugar-white sand as much as I do. My oldest will be graduating from Tulane this year as the youngest enters kindergarten at Bay Elementary. I also have both of my parents still living; Daddy is ninety-one, and Momma still won’t tell us her age. I am very blessed! VIE: Can you tell us a little about your clients? LM: Most of my clients are looking for a good investment property or a beach home for their family to make memories. Sometimes they are looking for a permanent residence. Our market has a fabulous rental potential for those savvy investors who want to take their money out of stagnant bank accounts gathering dust and put it into a vibrant income-producing asset that they can also enjoy with their families. They get appreciation, depreciation, free vacations, and much more. 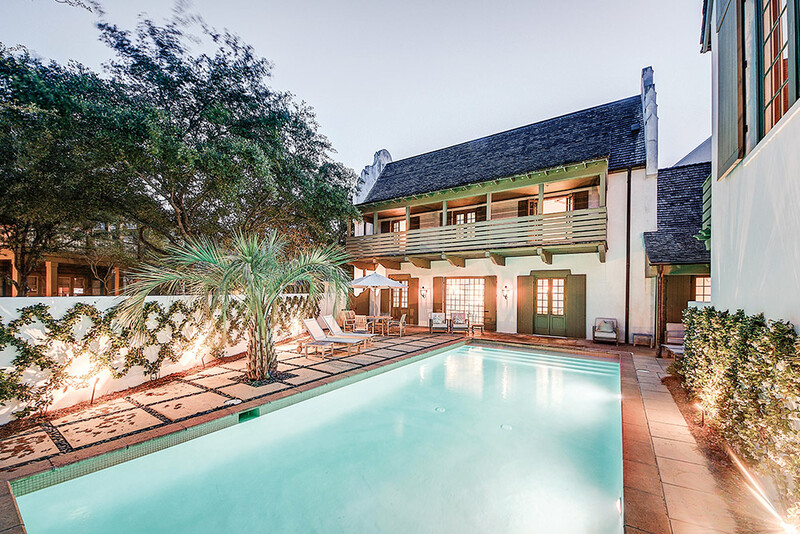 Our market has a fabulous rental potential for those savvy investors who want to take their money out of stagnant bank accounts gathering dust and put it into a vibrant income-producing asset that they can also enjoy with their families. Then there is the family who wants a second home just for their family to make memories and become a legacy for their children and grandchildren to pass down through the generations. 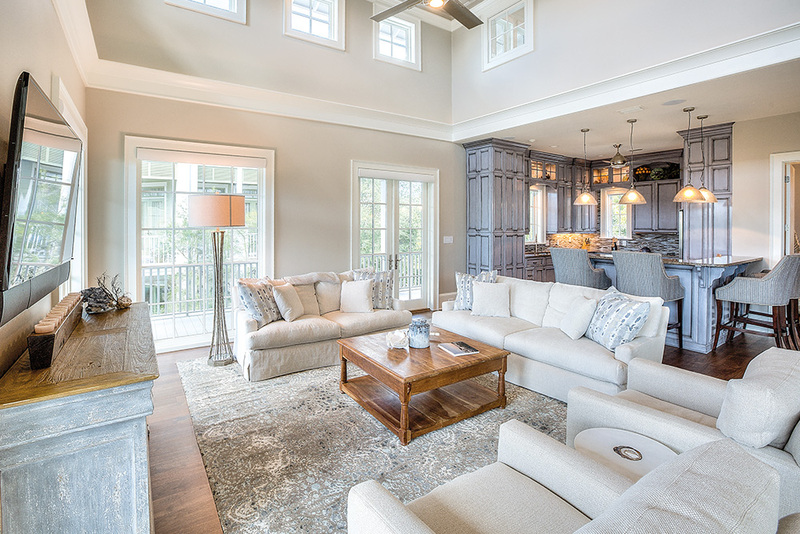 Even those permanent residents here are finding more “real” neighborhoods to live in as communities like Watersound Origins have grown to fill their needs. VIE: Have you had any celebrity clients looking in the area? LM: We love seeing some of our favorite stars living and playing along Highway 30-A, too. I got to meet Caroline and Luke Bryan when they bought a Gulf-front house I had listed, and that was fun! I have some other celebrity clients, but they wish to remain anonymous for now. VIE: What do you love about the Rosemary Beach community in particular? LM: The luxury of a planned community—and especially one by Andres Duany, a pioneer of traditional neighborhood development—has proved that these communities deliver a higher return on investment than random developments. Everything you need is within a five-minute walk, and the beach is a short walk or bike ride from every home! Restaurants, shops, and lodging create a synergistic town center along Main Street, and this is what we love about Rosemary Beach. VIE: We know you are involved with a lot of philanthropic organizations in the area. Can you tell us a little about them? Habitat for Humanity is another organization that is very dear to me. My real estate partner, Susan Sullivan, was tragically killed in a traffic accident in 2003. I had talked to her that morning on the phone and told her I loved her; that afternoon, I got the call that she had gone to be with Jesus. The only way to make the most of the situation was to “get busy” creating a memory for her, so I headed an effort by the Emerald Coast Association of Realtors to build the Susan Toler Sullivan Habitat for Humanity house. It was one of the most rewarding things I’ve ever done, and we provided a home for a family. I knew she was smiling down from Heaven that day. When I found out about Food For Thought Outreach’s backpack program to help children with “food anxiety” (not having readily available meals at home on the weekends) in this affluent county, I got very involved through our church, and we helped the program get off the ground several years ago. Food For Thought’s founder, Tiffany Shelton, was operating out of a temporary building at the time, and she has come such a long way with the help of our community! I still support this very worthwhile cause. The arts are an important part of our community and Sinfonia Gulf Coast is also very close to my heart. I always support its Musicians in the Schools program through sponsoring the annual Wine Women and Shoes events. My son-in-law, who is a musician, was the guest conductor for the Alys Beach Memorial Day concert. The Cultural Arts Alliance of Walton County is another organization I’m happy to support. We’ve done South Walton Fashion Week photo booths and had residences on the Valentine Tour of Homes circuit, among other things. 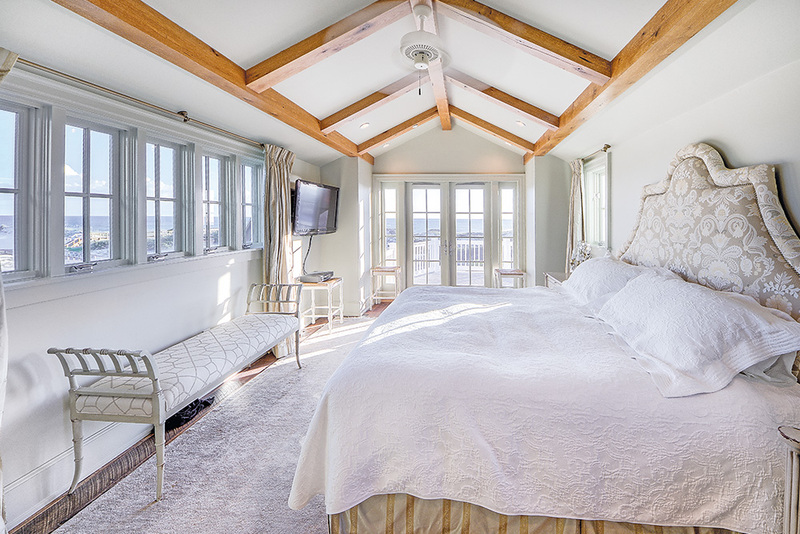 VIE: What’s one of your top properties on the market right now? LM: There is a 150-foot Gulf-front lot near Gulf Place that’s just begging for a dream house. It is the largest parcel available to buy on Scenic Highway 30-A, with over an acre for $7,650,000. 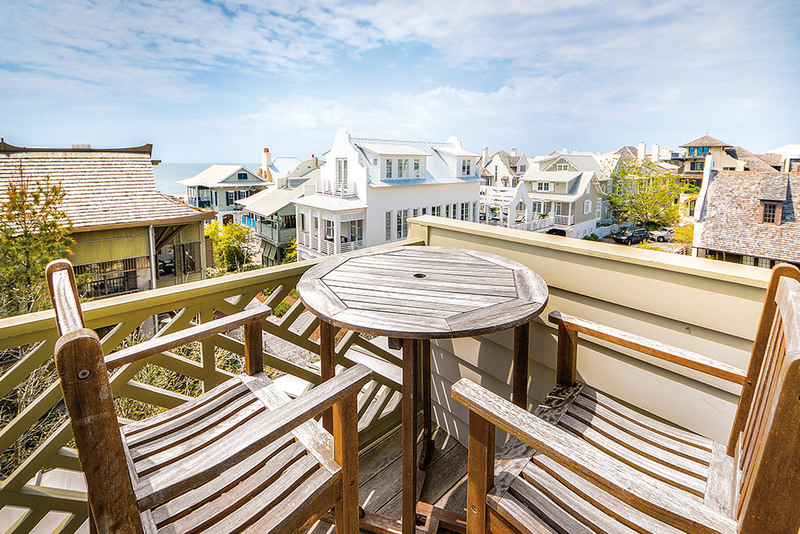 In Rosemary Beach, 267 West Water Street is a beautiful home that produces almost $300,000 in rental income per year. There are so many wonderful properties on the market in this area, and with market values increasing each year, there really couldn’t be a better time to invest in a home away from home or a new permanent residence by our beautiful beaches. VIE: Lastly, where can we get one of those couches? LM: Sadly, I don’t think they are available any longer, but if you find one, I need a new one—mine has many miles and many smiles on it!